It’s old news, I know, but getting my toddler to eat veggies is a daily struggle. However, the more creative I’m getting with hiding or enhancing the flavor of different veggies, the more fun it’s becoming. I don’t really see it as a ‘struggle’ anymore, but rather as a challenge! I’m taking it one vegetable at a time. The most recent being the zucchini. It’s great raw in a smoothie! Who would have thought! But tonight I was feeling adventurous and decided to try a fritter. I sorta followed the guidelines one would use for a burger. I wanted it to be juicy, savory, crunchy on the outside, and stick together when I flip it over. Two staples: flour and eggs. I used gluten-free flour. I had some oats, a bag with half a cup of almond flour, and a few tablespoons of coconut flour left in my pantry, so I just threw that all together. It came down to about 1/3 of each type. But please just use whatever you have! 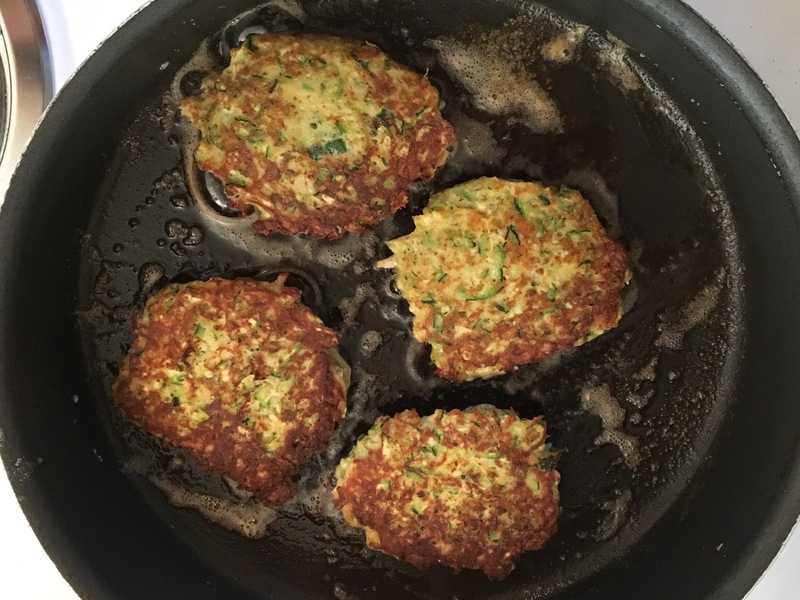 This recipe makes about 8-10 fritters. The cheese is optional. They are best fresh and hot right out of the pan. For dinner I didn’t really feel the need to make an additional starch because of the flour in the recipe. So we just had these with some sausage and a few cherry tomatoes. I will definitely be making these again! They were filling and satisfying, pretty healthy, and easy to make! Oh, and in case you were wondering, my toddler ate 1/2 of one fritter (that’s a win). And… I ate all the rest, of course. Grate the zucchinis by hand or with a food processor. 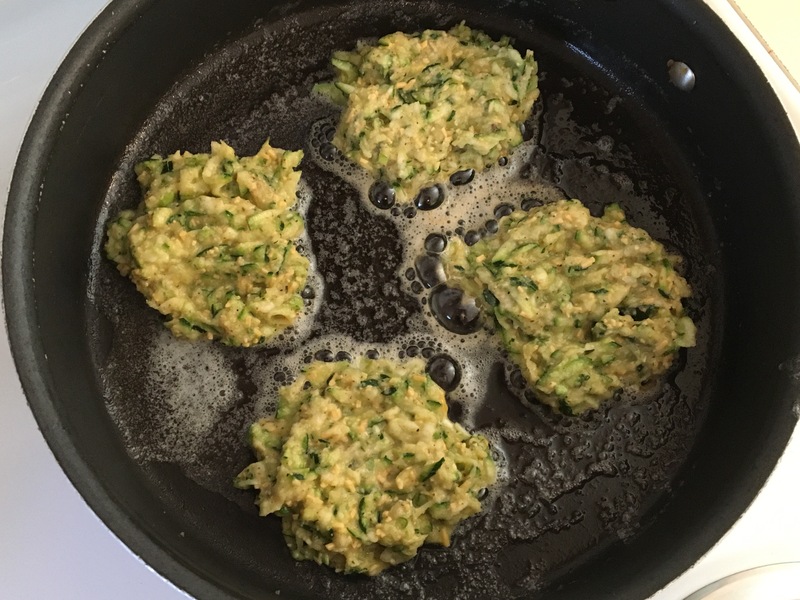 Lay the grates zucchini in a kitchen towel and squeeze over the kitchen sink to get as much liquid out as possible. The more liquid you can get out, the better the patties will stick together. 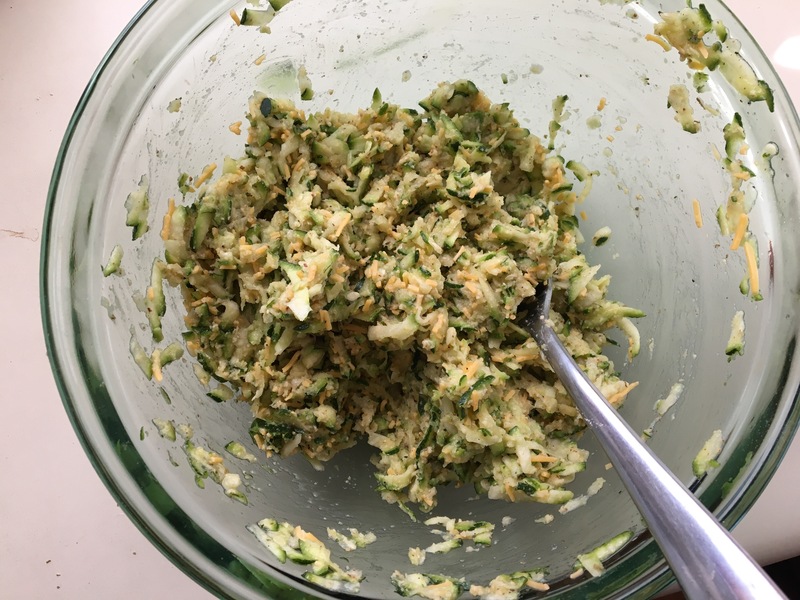 Put the zucchini in a large bowl and add all the other ingredients except for the butter. For the gluten free flour, I used a mix of 1/3 oat flour, 1/3 almond flour, and 1/3 coconut flour. Use whatever gluten-free flour you have in the pantry. Mix well with a fork. Heat a large (cast-iron) skillet on medium heat. Add 1/2 T butter. When melted, drop 4-5 large scoops in the skillet and flatten each one a bit. This should be about half of your mixture. Cook for about 5 minutes on one side, flip over, and cook for another 5 minutes, and remove. Repeat with the second half of the batch and another 1/2 T of butter. Next on my zucchini to-do list: zoodles.